Home > News > Fastener Fair was a great success! Sormat participated for the 4th time to the international Fastener Fair in Stuttgart. Our aim was to attract exhibition visitors, create instant interest towards Sormat brand and products, leave a positive memory trace and stand out from the competition. Wa also wanted to communicate our old and new customers the good news about Sormat being now a member of the EJOT family. We used the ancient Nordic mythology as the main theme of the stand to build Sormat brand awareness. We wanted to convey a professional and positive image so that the customers can easily approach us as we are not too stiff! The reception by the visitors was very good. Our aim was naturally also to get new dealers and distributors for Sormat products, and to strengthen the trust with old customers. Based on the feedback we can say that these goals were met very well. 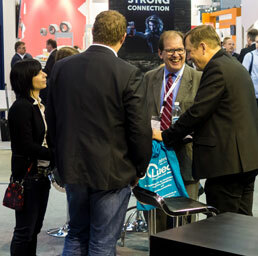 We had a pleasure to meet many new EJOT colleagues visiting our stand. I hope they had a good impression of our stand, and Sormat as a company. In products we put most efforts on our novelties and best sellers. Sormat’s new Finnish made concrete screw with ETA optio 1 approval S-CSA was launched at the fair. The novelty concrete screw and the other Sormat best sellers were presented with 3D animations and lenticular product posters, which gave a magical moving back ground effect of Nordic history to Sormat’s state-of-the art products. The product range of Sormat represents an important extension for EJOT Building Fasteners. Sormat headquarters and factory in Finland will be a competence center of heavy anchors for the whole EJOT Group. Sormat manufactured anchoring products in EJOT boxes are soon sold in every EJOT subsidiary world-wide. In paralle Sormat will also in the future operate independently with its own Sormat and Liebig brands on the global market. The EJOT Building Fastener range will be taken to Sormat distribution in Finland, and the fair was a good event to collect specific needs of our old customers. These fairs are always very heavy exercises to the team, especially the sales and marketing people. Maybe the biggest part of the head ache is about finding the right theme to fit the purpose of the fair. Sormat tradition is not to go with a standard corporate identity to all fairs year after year, but instead to create something new and attractive to every fair. I want to thank the whole Sormat team for making the Fastener Fair again a successful and memorable event.